in Stamp Club last night! I usually never complete anything when I go to Stamp Club so me finishing even one card is quite a feat! I generally am too nosy seeing what everyone else is doing and talking to be able to complete a card. Linda came to town around 4pm and we headed off to Walmart so she could look for some ribbon she was needing. We then went and ate dinner at the Super China Buffet. We usually go to Applebee's but we are about Applebee'd out at this point. After dinner we decided to go ahead and go to Scraptopia, where Stamp Club is now being held. Of course that meant browsing through the store! I quickly found some really great paper on clearance for 25 cents a sheet. After I got all I wanted I went and showed Linda *okie smiles to herself at her sly move of making sure she got what she wanted before informing Linda of the awesome sale*. The ladies who own the store are so awesome and are always ready to help us find what we need. They are also very willing to order things if we ask. This time we asked for refills for our Memento ink pads. Linda and I may have caused some others to get addicted to the ProMarkers! 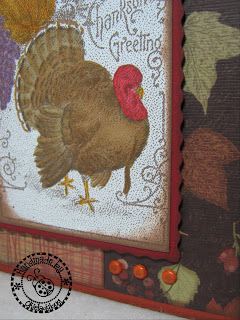 Carol, the lady who runs Stamp Club, brought a ton of great Thanksgiving stamps and I chose a vintage looking one that had a turkey. She said it was meant to be just stamped and used but I couldnt resist using my ProMarkers on them *okie thinks she better start using those markers more before she forgets how to use them*. Since the stamp was so detailed I didn't want to color everything because it would have taken me 3 days to get it all colored. The turkey was pretty easy to color but I had to look at a picture to decide how it needed to be colored. I used 4 different shades of brown and to be honest right now I can't remember which ones. I dipped 3 orange brads into the Cat Eye Chestnut Roan chalk ink to tone down the color a little and make them blend with the colors of the card a little more. The wavy edge on the deep red paper is a blade from the Your Story Trimmer *okie suddenly remember she never posted about getting the Your Story bundle and makes a mental note to do a blog post about it*. I really like the trimmer. It is convenient to take to Stamp Club but it won't take the place of my beloved Xacto Guillotine trimmer. My friend Lisa is coming over this evening to help me work on the spa sock cupcakes. I have the wrappers all cut and put together, the socks all rolled and in the wrappers. We just have to add the little cherry pom poms and package them up. I will be posting them once they are all done and I get pictures taken. I really like your card ! This would be a great stamp to have. 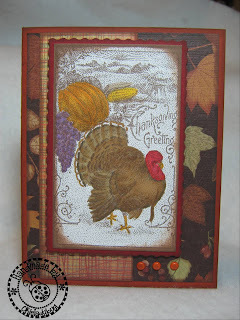 I had a group of ladies last week trying to make Thanksgiving cards and I couldn't find anywhere selling Thanksgiving stamps. Nice ! What a beautiful card, I really like the details; tfs. Notice that Shirley said she got all the sale paper she wanted before she told me about it. **sigh** LOL! That's a beautiful card. 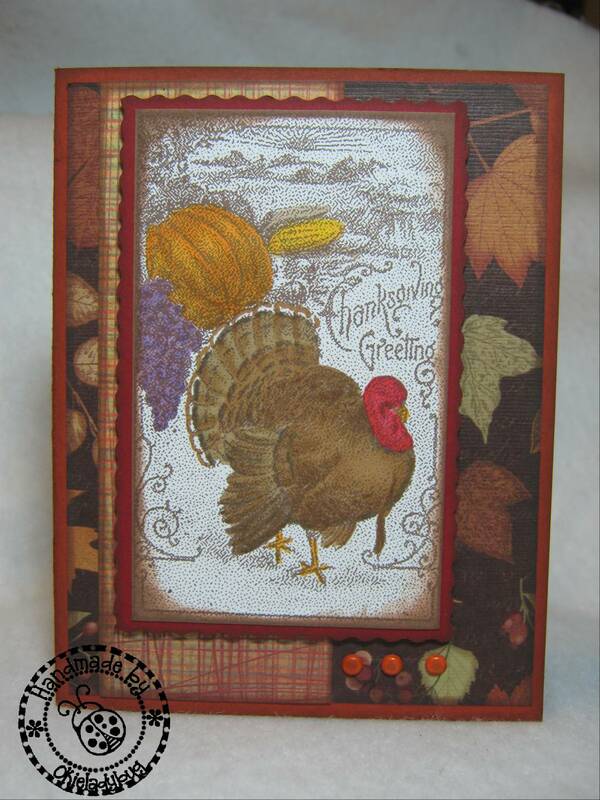 Makes me think of Thanksgivings past. I love your card Okie! It's really very pretty the way you colored it. I have been waiting for the Promarkers to go on sale to oreder more. Hope they will soon. Thanks for mentioning the blades for the your story trimmer. I have had mine for 6 months and never opened the package. I will now!